The way you present your business can make a big difference when it comes to how your customers will perceive your business. 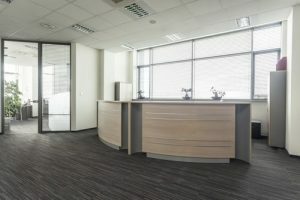 A well-kept floor says a lot about your company and can have a big impact on how a customer perceives your business, so we think it’s important to offer commercial flooring options that help you make a good first impression. We have experience install flooring in all types of commercial and industrial buildings in Lindon UT 84042 including medical offices, apartment buildings, supermarkets, high rises, institutions, health care facilities, condos, shopping centers, universities, hotels, town homes, nursing homes, strip malls, movie theatres, association complexes, hospitals, offices, daycare centers, & more! Whether its tile, luxury vinyl tile, linoleum, laminate, hardwood, or carpet; if you need to replace the floors in your workplace, give us a call. No matter your style, budget, or needs, SLC Flooring has top name brand products and affordable installation services you need. We are a full service floor company in Lindon UT serving residential and commercial clients throughout the county. We are locally owned and run and fully insured. We offer the greatest quality commercial floor solutions for you. We make it a point to always listen thoroughly to your issues and only provide truthful and reasonable answers. We concentrate on delivering top-notch workmanship using only the finest materials, to ensure our customers’ complete satisfaction. Our commercial flooring specialists care a lot about building long-term relationships with our clients. SLC Flooring incorporates years of training with competence to guarantee that the product you want is the one that you’ll receive. We encourage that you take a look at all the services we offer and find out why we are the preferred choice for commercial floors in Lindon and nearby areas. Our primary objective is to make sure our clients are delighted with the outcome of their project. Our company believes in quality work and will not compromise on the end results to increase revenue. We have one of the top track records in the city so you can be sure your project will get done the first time correctly. Call us now at 801-515-0047 for a free consultation. Lindon is a city in Utah County, Utah with a total population of approximately 10,094. Lindon, which uses the 385/801 area code, is located at 40.34074, -111.71528 at an elevation of 4,512 feet. There are over 2,524 households and on average there are 3.97 people in each household with a median age of 26.2. The average income in the area is $86,618 and the average home value is $318,700.